Troy Rosario with expectant wife Mich. 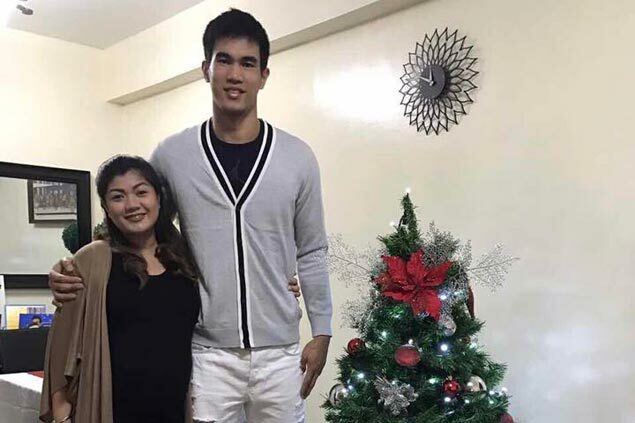 TROY Rosario is set to receive a late Christmas and early birthday present at the same time as he’s about to become a father. Asked how he’s spending his two-day vacation and New Year’s eve after their last practice for the year was held last Thursday, the Texters forward said he’s just at home with expectant wife Mich.
“Bahay lang, waiting manganak si Mich,” Rosario said in a text to SPIN.ph. Mich was supposedly slated to give birth on January 20, the same day Troy turns 25, but the couple is now bracing for an early delivery of their daughter they are naming Zoey Isabelle. “Birthday ko due, pero…pinaglalakad na (si Mich),” Troy disclosed, referring to his college sweetheart at National University. It’s definitely another blessing after a year full of many for Rosario, who put up an impressive rookie year in the pros – barely missing out on the Rookie of the Year award, played for Gilas Pilipinas in the Olympic Qualifying Tournament, and has now emerged as one of the Texters’ stars. Work resumes for Rosario and the rest of the Texters as they report back to practice less than a day after Media Noche.